You ever notice how some of the so called experts rarely talk about the things that went wrong on their projects. They make it seem like they are perfect in their execution and anything that goes wrong is an easy fix given how smart they are. I don’t know about you but I know of some really bad data centers out there that have been the vision of some experts. :-) In general, their way of getting out of accountability is they say the operations crew is to blame. The real experts know mistakes are made and they need to learn from them. In Seattle is the largest tunnel-boring machine in the world and it broke. The media went wild pointing the fingers of blame at politicians as if they know how to design and operate a tunnel-boring project. The politician is going to say whatever they think they can to benefit their goals. This is the mistake the so-called experts make as well, to think they can say whatever they think they can to benefit their goals. Well when you dig a big tunnel, things go wrong. In the case of the Seattle tunnel-boring, they went really bad requiring repair work over the cost of the boring machine. Popular Mechanics post on the repair project and the author jumps on the media. What do you do when the world's largest tunneling machine is, essentially, stuck in the mud? Bertha is 60 feet under the earth, and you're on the surface watching a squirmy public swap rumors of cost and delay on the $1.35 billion tunnel component of an even larger transportation project, and the naysayers are howling: Just you watch, Bertha will be abandoned like an overheated mole, boondoggle to end all boondoggles. Because, don't forget, when you're boring the world's largest tunnel, everything is bigger—not just the machine and the hole and the outsize hopes but the worries too. The cynicism. 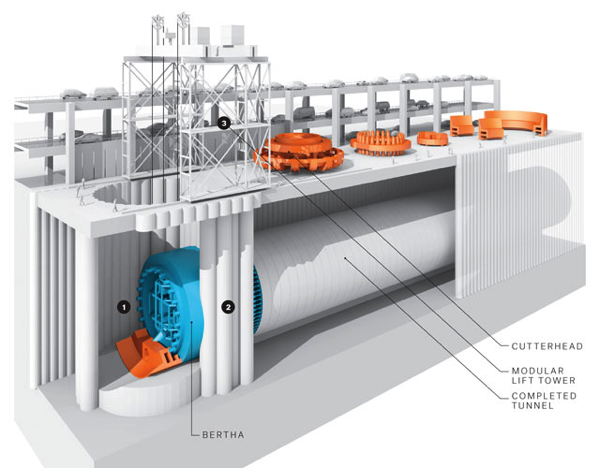 The post tells the engineering story of trying to repair the tunnel-boring machine. The YouTube video embedded in the article is available here.